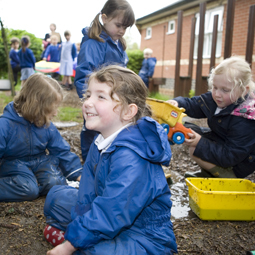 The Curriculum within the Early Years Stage is planned around four main themes: 1) A unique child, 2) Positive Relationships, 3) Enabling Environments, 4) Learning and Development. read some common irregular words. They demonstrate understanding when talking with others about what they have read. They also write some irregular common words. They write simple sentences which can be read by themselves and others. Some words are spelt correctly and others are phonetically plausible. single-digit numbers and count on or back to find the answer. They solve problems, including doubling, halving and sharing. They know that other children don’t always enjoy the same things, and are sensitive to this. They know about similarities and differences between themselves and others, and among families, communities and traditions. things. They talk about the features of their own immediate environment and how environments might vary from one another. They make observations of animals and plants and explain why some things occur, and talk about changes. and purposes. They represent their own ideas, thoughts and feelings through design and technology, art, music, dance, role play and stories. 1) We work towards the Early Learning Goals 2) We use observations of children in child-initiated and adult directed activities. 3) We use the observations to plan effectively to meet children’s learning needs. 4) We monitor the concepts and skills that children are developing. 5) Children are assessed and monitored effectively to show children’s progression. 6) We record children and parents viewpoints. 7) At the end of the year we complete the EYFS profile. 8) We support children with transition into Key Stage 1.